The Youth Media Team is a group of teenagers who attend and report on a wide range of educational conferences all around Ireland. They came together in May 2013, and have been nicknamed the “red shirts” bringing a technology based mix of interviewing, blogging, and Tweeting to a various number of educational events. Recently, they attended the #GREAT14 Conference in Galway, Ireland, that was hosted at the National University of Ireland and presented by the Year Two cohort of Michigan State University Masters of Arts in Educational Technology students. The Youth Media Team were the keynote speakers for the conference, actually demonstrating two interviews in front of all of the attending participants. They then went on to discuss how they became involved with the group, and also filled attendees in on their goals in life. After a session I led on Developing 21st Century Skills using Mystery Skype, I was lucky enough to have the chance to be interviewed by Jack, one of the Youth Media Team members. What surprised me most when being interviewed, was how quickly Jack had taken information from the session and created well composed questions to gain more knowledge around the content area. You can access the interview through this link. 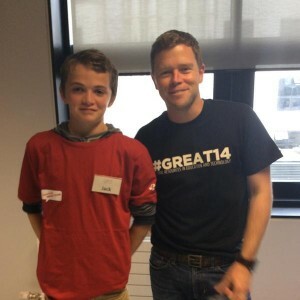 To can check out more of the Youth Media Team’s interviews from the #GREAT14 conference as well as past conferences, access their website: ymt.fm.